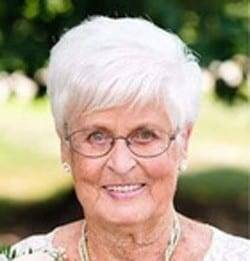 Marilyn J. Adams, age 89, of Edgerton, Ohio, passed away at 2:45 P.M. on Saturday, March 23, 2019, at Park View Nursing Center in Edgerton with her family at her side. Mrs.
Adams was a 1948 graduate of Spencerville High School in Spencerville, Ohio. She had been employed at Fleetwood Industries in Edgerton until her retirement, at which time she and her husband moved to Florida for ten years. While in Florida she worked at several groceries in the Publix grocery chain. Upon returning to Edgerton she was employed by the C-Store in Edgerton for twenty years, working to the age of eighty-five. She attended Life Changing Realities Fellowship in Edgerton, where she was active working in the church cafe, being affectionately known as the “donut lady.” She was a member of the Edgerton Fire Department Ladies Auxiliary, the Red Hats and the Priscilla Club. Marilyn enjoyed decorating for every holiday, collecting Holly Hobbies, shopping and attending her grandkids’ and great-grandkids’ sporting events. Marilyn J. Adams was born on July 16, 1929, in Spencerville, Ohio, the daughter of Cordier and Edith (Pierstorff) Hiles. She married Richard B. Adams on November 4, 1949, in St. Marys, Ohio, and he preceded her in death on September 29, 1996. Survivors include two daughters, Becky (Doug) Mavis, and Pam (Tim Clifton) Wyse, both of Edgerton; three sons, Rick (Sue) Adams, of Edgerton, Jeff (Claudia) Adams, of Defiance, Ohio, and Byron (Gayle) Adams, of Edgerton; thirteen grandchildren; twenty-five great-grandchildren; one great-great-grandchild; two step-grandchildren; four step-great-grandchildren; two step-great-great-grandchildren; one brother, John (Jane) Hiles, of St. Marys; one sister, Judy Howell, of Fort Myers, Florida; and three sisters-in-law, Jeri Adams, of Celina, Ohio, Maxine Reamsniter, of Coldwater, Michigan, and Linda Laughlin, of Tucson, Arizona. She was also preceded in death by one brother, Rex Hiles, and two sisters, Lois Snavely and Connie Stuckey. Visitation will be held on Sunday, March 31, 2019, from 2:00-7:00 P.M. in the Krill Funeral Home, 114 East Hull Street, Edgerton. Services will be held at Life Changing Realities Fellowship on Monday, April 1, 2019, at 11:00 A.M. with Pastor Byron Adams officiating. Interment will follow in Maple Grove Cemetery, Edgerton. In lieu of flowers, memorials are requested to the Baker Family Fund in care of Hicksville Bank. Be the first to comment on "Marilyn Adams (1929-2019)"